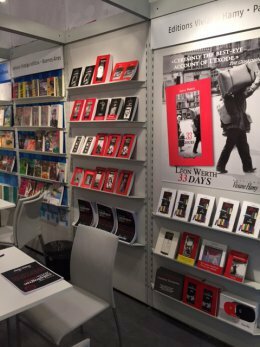 I am pleased to present below our highlights for the forthcoming Frankfurt book fair. Should you wish to receive a finished copy or proofs, do not hesitate to contact me. This year, our stand of independent publishers will celebrate its 10th anniversary ! You are warmly invited to join us on Thursday 20th October from 5.30pm at our stand in Hall 5.1, C122 to drink to world literature and international friendship ! A cross-over novel (originally written in 1970) still widely studied at school in Hungary. It captures the intensity and raw emotion of teenagers’ reading experience, as well as giving an insight into life in “Mitteleuropa” during World War II. In 2015, Szabo’s The Door was selected as the best book of the year by the New York Times. Kabukicho : a crime in the hottest district of Tokyo ! Dominique Sylvain lived for many years in Japan. This sophisticated literary mystery takes place in underground Tokyo. An intense novel, which relies on an outstanding exotic atmosphere, it will, udoubtedly, “lose you in translation” ! A boy discovers the art of cooking, but also the pleasure of flesh. He becomes a talented Parisian chef. Perfume by Patrick Süskind meets Ratatouille !